Article Seven of the United States Constitution sets the number of state ratifications necessary in order for the Constitution to take effect and prescribes the method through which the states may ratify it. Under the terms of Article VII, constitutional ratification conventions were held in each of the thirteen states, with the ratification of nine states required for the Constitution to take effect. Delaware was the first state to ratify the Constitution, doing so on December 7, 1787. On June 21, 1788, New Hampshire became the ninth state to ratify the Constitution, ensuring that the Constitution would take effect. Rhode Island was the last state to ratify the Constitution under Article VII, doing so on May 29, 1790. On September 20, 1787, three days after its adoption by the Constitutional Convention, the drafted Constitution was submitted to the Congress of the Confederation for its endorsement. After eight days of debate, the opposing sides came to the first of many compromises that would define the ratification process. The Confederation Congress voted to release the proposed Constitution to the states for their consideration, but neither endorsed nor opposed its ratification. In 1787 and 1788, following the Constitutional Convention, a great debate took place throughout the United States over the Constitution that had been proposed. The supporters of the Constitution began the ratification campaign in those states where there was little or no controversy, postponing until later the more difficult ones. On July 21, 1788, New Hampshire became the ninth state to ratify the Constitution, thus establishing it as the new framework of governance for the United States. Though officially enacted, four states, Virginia, New York, North Carolina and Rhode Island remained outside the new government. The Congress of the Confederation chose March 4, 1789 as the day "for commencing proceedings under the Constitution." Virginia and New York ratified the Constitution before the members of the new Congress assembled on the appointed day to bring the new government into operation. After twelve amendments, including the ten in the Bill of Rights, were sent to the states in June 1789, North Carolina ratified the Constitution. Finally, Rhode Island, after having rejected the Constitution in a March 1788 referendum, called a ratifying convention in 1790. Faced with the threat of being treated as a foreign government, it ratified the Constitution by the narrowest margin (two votes). Secessionists have used Article VII to argue that states have a right to secede from the Union by revoking their ratification of the Constitution. Virginia's ratification of the Constitution declared that, "the powers granted under the Constitution being derived from the People of the United States may be resumed by them whensoever the same shall be perverted to their injury or oppression." New York and Rhode Island's ratifications likewise declared that, "That the powers of government may be reassumed by the people, whensoever it shall become necessary to their happiness." The New York Convention also contemplated going a step farther, adding language to the effect that "there should be reserved to the state of New York a right to withdraw herself from the union after a certain number of years." The Madison federalists opposed this, with Hamilton, a delegate to the convention, reading aloud in response a letter from James Madison stating: "the Constitution requires an adoption in toto, and for ever" [emphasis added]. Hamilton and John Jay then told the convention that in their view, reserving "a right to withdraw [was] inconsistent with the Constitution, and was no ratification". The New York convention ultimately ratified the Constitution without including the "right to withdraw" language proposed by the anti-federalists. 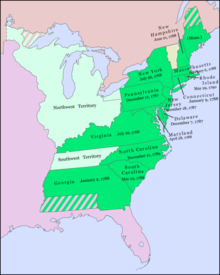 At the start of the Civil War, four of the original thirteen states seceded from the Union, South Carolina, Georgia, Virginia, and North Carolina. In their ordinances of secession they declared that their newly elected conventions were repealing the acts of the previous conventions ratifying the Constitution. Abraham Lincoln maintained that secession was unconstitutional, and ultimately these States along with the other Confederate States were defeated. ^ "Article VII, Ratification". Cornell University Law School. Retrieved November 4, 2016. ^ "The Six Stages of Ratification - Teaching American History". ^ "The States and the Ratification Process". Center for the Study of the American Constitution, University of Wisconsin–Madison Department of History. ^ "Article VII. Ratification". Justia. ^ "Observing Constitution Day". National Archives. August 15, 2016. Retrieved November 14, 2018. ^ a b Amar, Akhil Reed (September 19, 2005). "Conventional Wisdom". The New York Times. Archived from the original on May 29, 2015. Retrieved May 29, 2015.